I know I'm not the only parent who dreads one thing about back-to-school time - namely having to prepare healthy, appealing lunches for the kiddos five days a week. 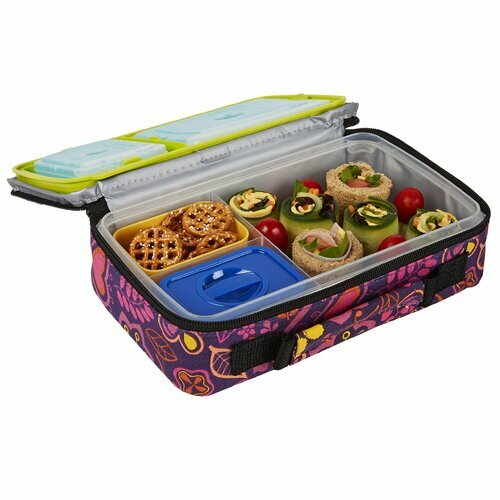 Wayfair challenged me to come up with a fresh spin on school lunch. 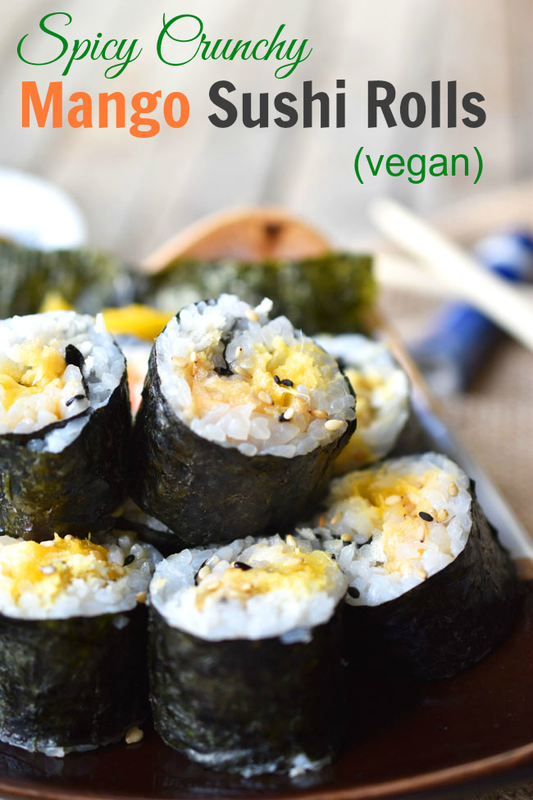 I knew immediately what I wanted to do - vegan sushi rolls! There are many meals we disagree on in this house, but sushi is never one of them. We all love sushi rolls with a passion. 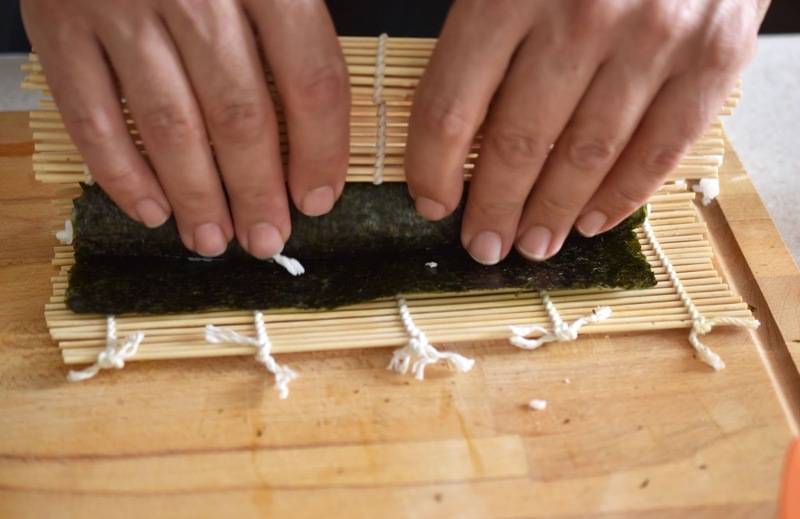 It may seem like an effort to make your own sushi rolls, but once you get the hang of it, it's really not so hard. 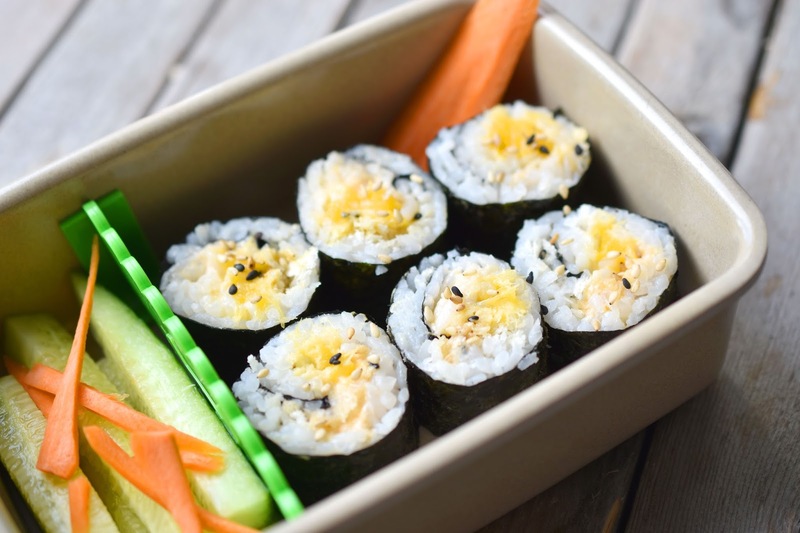 Make a gigantic batch for dinner, getting each family member to roll their own, and you'll have enough left to pop into your bento box the next day. Before I share my easy recipe for vegan Spicy Crunchy Mango Sushi Rolls, I want to show you some other simple toppings that we put out when we make our own sushi. My daughter still likes to keep it pretty simple for the most part. She's a fan of cucumber rolls. We also put out carrots, peppers and avocado. Ideally you should make the sushi rice a bit earlier in the day to let it cool, but you can also spread it out in a baking dish post-cooking and mix it around with a spatula to cool it. 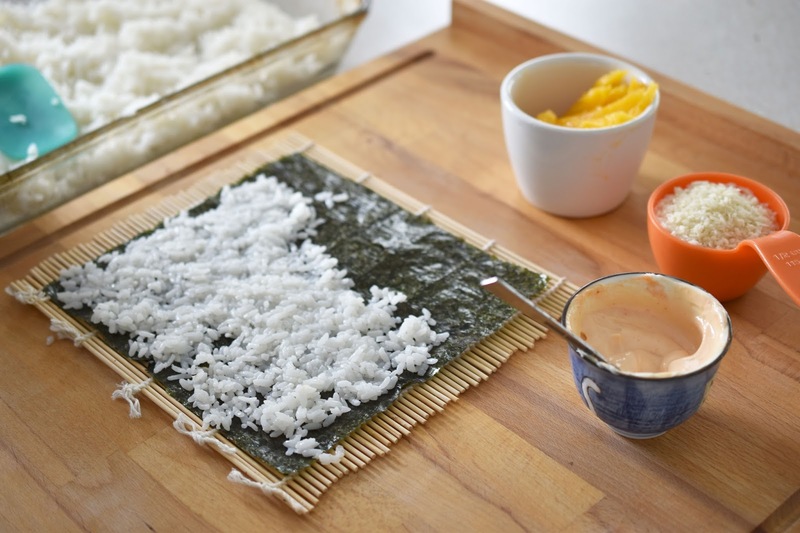 Be sure to place a bowl of warm water at your work area so that you can dip your hands in it - that will make the application of the rice to the nori (seaweed) much easier. This is about the thickness we tend to apply the rice, above. Leave about an inch of the nori clear at the far end. Don't be shy with the toppings - you'll get a nice full roll if you're generous. 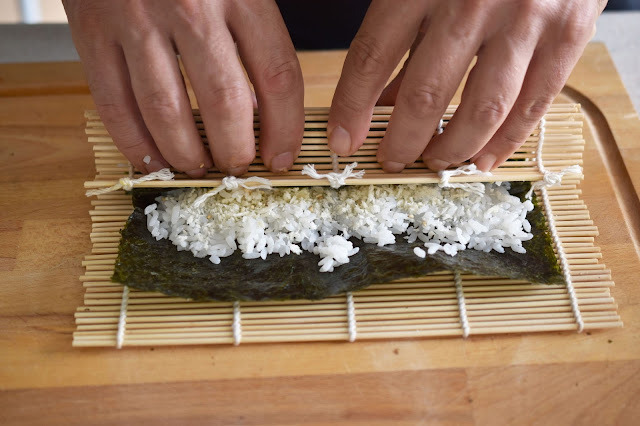 Lay your toppings along the bottom third of the nori seaweed so they end up in the middle of the roll. 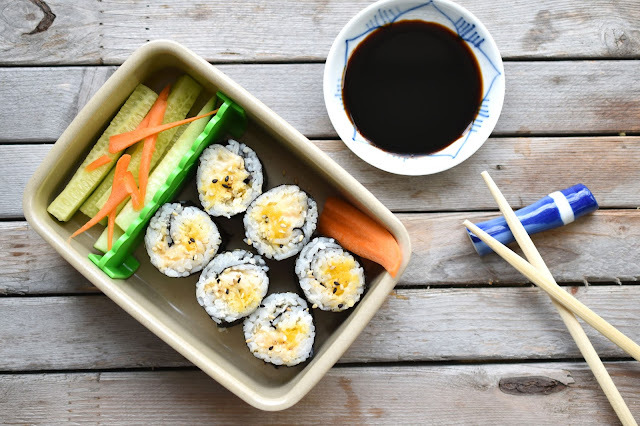 For our Spicy Crunchy Mango Sushi Rolls, we used fresh mango (naturally), Panko bread crumbs, sesame seeds and a spicy vegan mayo. 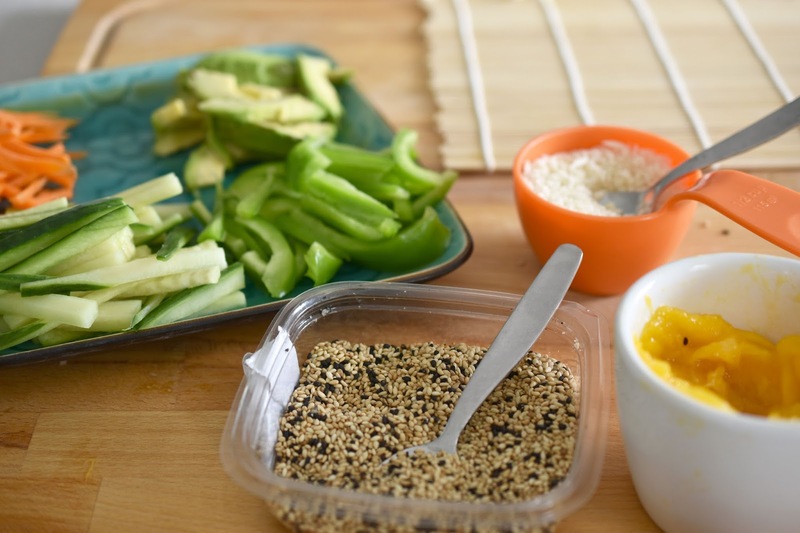 For a really crunchy roll, be sure to use plenty of Panko bread crumbs, even more than you think you'll need. 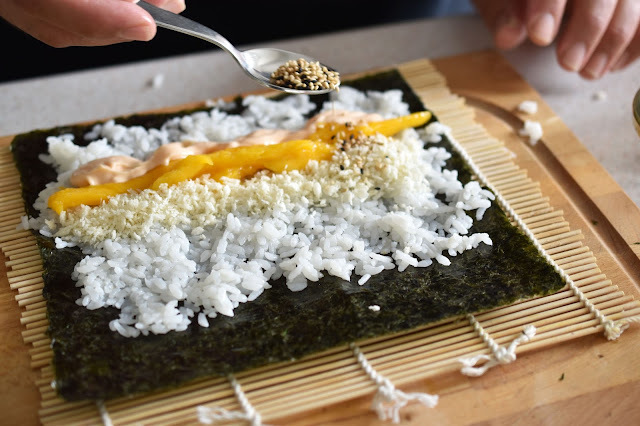 A sushi rolling mat makes your work easier. I think the secret to a successful roll is in the first turn of the mat. Roll up slightly and then tuck the first bit of seaweed around the fillings using the edge of the rolling mat. Keep rolling until you reach the end of the seaweed. Dip your fingers in the warm water and create a seal at the end by applying warm water against the bare end of the seaweed. Now I'm not exactly looking forward to making school lunches everyday, but at least I have one fresh option to add to my weekly list. And it's an option I know the kids are going to love! If you are a sushi fan, be sure to try out my recipe for Spicy Crunchy Mango Sushi Rolls, below! Are you a sushi fan? Do you make your own or hit up your fave Japanese restaurant? Cook rice according to package directions. Pour cooked rice into a long glass baking dish. Drizzle on rice vinegar and sprinkle on salt. Mix through rice using a spatula. Continue turning over rice until it cools. 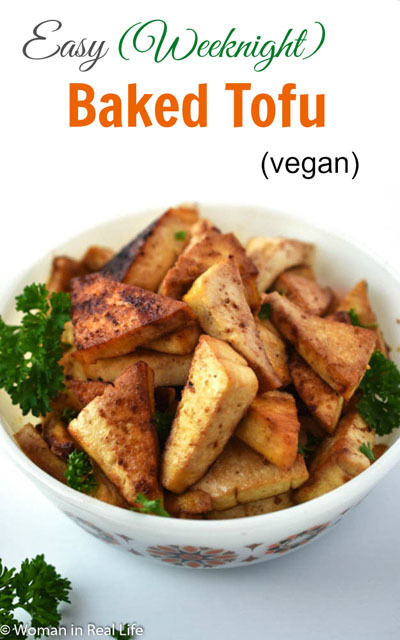 In a small bowl, mix together vegan mayo and sriracha. Spoon mayo/sriracha mixture in a line along the bottom third of the seaweed sheet. Do the same with the Panko bread crumbs. Sprinkle on sesame seeds if desired. Place mango strips in a line across the seaweed, on top of the other toppings. Cut into sushi rolls using a sharp knife. 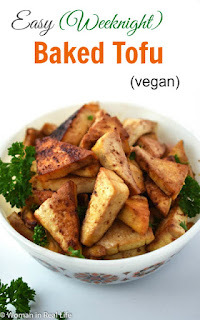 *Portions are approximate, depending on how full you stuff your rolls. 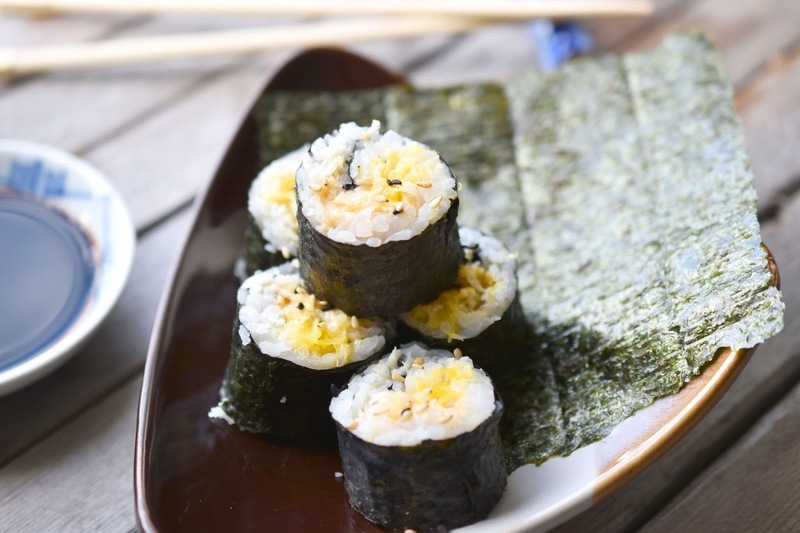 Use any leftover rice and seaweed to create other rolls, such as avocado, cucumber and carrot rolls. *This post is sponsored by Wayfair. All opinions are authentic and my own. Thank you for supporting the awesome companies that partner with Woman in Real Life. Yummy! Wanna make me some?